The purpose-built Ariake Arena has been confirmed as the venue for the indoor volleyball competition at the Tokyo 2020 Summer Olympic Games. The arena, set to be built for the Olympics, was approved by the International Olympic Committee in 2015, but was put under further scrutiny after costs for the Games began spiraling billions of dollars over estimates even four years out. The decision to stick with the arena was announced Friday by Tokyo Governor Yuriko Koike after costs were reduced by ¥6.5 billion ($55.1 million) from original estimates. The effort was part of an overall ¥40 billion ($339 million) savings in the construction costs of three venues after scrutinizing both construction and operating costs of the volleyball, aquatics, and canoeing venues. 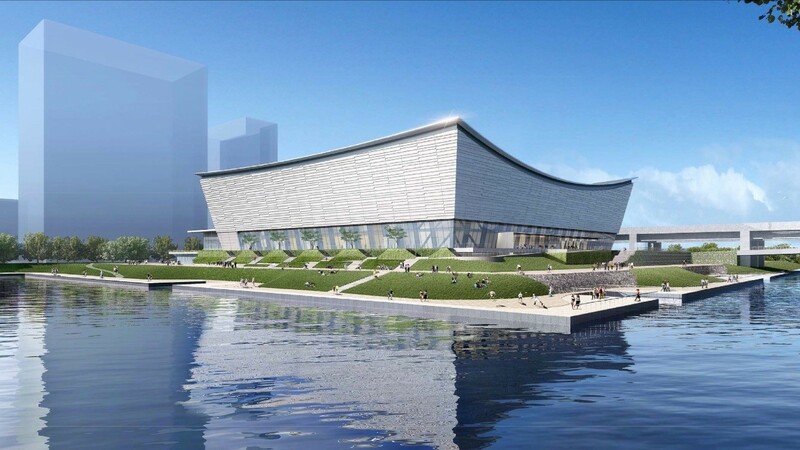 The cost of the volleyball venue will drop from ¥40.4 billion to ¥33.9 billion ($288 million); the cost of the aquatics venue will drop from ¥49.1 billion to ¥29.8 billion ($250 million), and the cost of the canoeing venue will fall from ¥68.3 billion to around ¥52 billion ($440 million). By comparison, the renovation to the 60-year old Maracnazinho used for volleyball in Rio cost just under $30 million and the temporary Rio Olympic Aquatics Center cost $38 million. We were unable to find final costs for the Deodoro Olympic Whitewater Stadium, but pre-games estimates put it at around $20 million. Koike credited upgrade in technology as part of the reason for the cost savings, and even hinted that geothermal energy could be used to achieve greater savings. The proposal was put forth by a cost-cutting panel set up by Koiske in September specifically to review ways to reign-in costs. A prior proposal had been put forth to use the existing Yokohama Arena, built in 1989 but renovated in July 2016, for volleyball instead. Yokohama Arena, a 17,000-seat venue in the south of the city, is not currently in the organizing committee’s plan for venues. The IOC has urged Koike and the organizing committee to bring the cost of hosting the 2020 Games down from a ¥2 trillion ($16 billion) peak estimated by the organizing committee earlier this year. That estimate was 2.5 times the initial estimate of ¥734 billion ($6.2 billion) submitted in 2013. The Rio Olympics are estimated to have cost around $12 billion and the London Olympics four years earlier are estimated to have cost $14.6 billion. The 2008 Olympics in Beijing are estimated to have cost $40 billion and the 2014 Winter Olympics in Sochi, Russia are estimated to have cost $50 billion, though those events are aberrations even among a trend of escalating Olympic costs.